We will dance to music in 3/4 time, and perhaps explore other music as well. 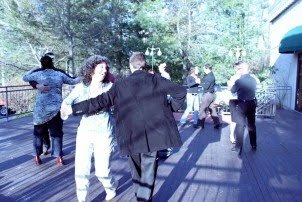 The waltz styles I prefer are rotary and cross-step, and will teach routines in these styles, but you can also dance other styles like box-step and ballroom. Check out this beautiful video to get an idea of what cross-step waltz looks like. No partner is necessary, but we will try to balance gender or dance roles (lead, follow). Please carry in clean NON-MARKING shoes. For more information, email Jody. About Jody. Jody learned to waltz on her father's feet as a little girl and has been dancing ever since. She's taken ballet, jazz, and modern dance, and dances all sorts of social dances, of which her favorites are, in no particular order, west coast swing, salsa, east coast swing, waltz (#1, really), Israeli folk dancing, and English country dancing. She's taught Israeli dancing, waltz, salsa, and east coast swing over the years. In this workshop series, she would like to improve her skill at leading her partner rather than a pattern, among other things.